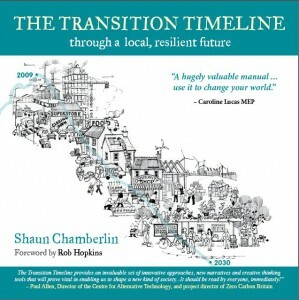 The Transition Timeline, for a local, resilient future, Shaun Chamberlin, Green Books/Transition Network, 2009. Review from issue 60 of Permaculture Magazine. This book doesn’t do what it says on the tin. It does, on the other hand, hold treasures which are not even hinted at in the title. A timeline, in the context of the transition movement, is an imagined story of the future. It helps us envision what the journey from the present to a more sustainable future might look like. First you imagine yourself at some time in the future when the transition is, if not an accomplished fact, at least well on the way to realisation. Then you imagine the milestones along the way which, year by year, got us from here to there. Examples might be: 2015, the majority of families grow their own vegetables; 2017, bikes on the road outnumber cars. It’s a valuable tool, especially when done as a community exercise. The gulf between where we are and where we want to be may seem huge and formless, but filling it with some concrete steps and markers of progress can bring it down to a manageable size and shape. But this book isn’t really about timelines. They do make an appearance but it’s a rather perfunctory one. In the heart of the book, Part Two, the author takes “a deeper look at the transition vision”, examining in turn population, food, energy, transport and health. But he gives far more space to descriptions of the present situation with respect to each of these than to the timelines. Having said that, these descriptions are very good. If you want a brief and easily-understood view of the way things are now, of how the world works, or rather doesn’t work, you need look no further. The timelines for each of these fields are not only short but rather puzzling. My understanding of the transition movement is that it’s all about what we can do as communities to confront the twin challenges of peak oil and climate change. The basic premise is that government action is always too little and too late, while acting as individuals is too daunting, but if we act as communities – towns, villages, islands etc – we have a chance of really changing things. But the milestones of transition in Shaun Chamberlin’s timelines are mainly government actions. He seems to regard the transition movement as mainly an exercise in demonstrating to the government how much we care, to the point where they will make the necessary changes. To me this is a complete travesty of the transition concept. There follows a section of the book written by Rob Hopkins which gives detailed descriptions of how timelines can be used in practice in the community. It includes exercises which have actually been used in Transition Towns Totnes and Lewes. In this part of the book, full of actual examples, timelines spring to life. This is all new stuff which doesn’t appear in Rob’s Transition Handbook and it makes a good supplement to that book. After this the author gives up on timelines altogether and starts to write the book he really wanted to write: a clear and concise account of the twin phenomena of peak oil and climate change. It’s brilliant. Shaun Chamberlin is one of those rare people who combines a deep and detailed knowledge of his subject, a strong passion for it and the ability to write about it in a readable and accessible style. It’s worth buying the book just for this part of it. It works both as an understandable summary for the beginner and a worthwhile update for people who already know something about the subject. This is the state of the art report on the two big challenges facing us, with their awesome complexity cut down to crystal clarity. I would urge everyone who cares about the future of the planet to read it. It won’t take you long. The picture which emerges is that the situation is more acute and more urgent than it appeared to be even a couple of years ago. If we want to have any future at all we need to get our act together, and fast. The Transition Timeline is available here. I think this is a misreading both of Shaun’s position – which, as presented to us, is very much about the power of collective, community action – and, more fundamentally, of the nature of government / power relations in our (UK) society. To my mind this book is all about timelines – but it isn’t about to write them for us – instead the book focuses on the broader context in which a community created timeline sits and, in Rob’s section, offers some tips on creating them. The book isn’t perfect, but it is a powerful tool designed to help us to stay focused and create more than just wish-lists. I really appreciated Patrick’s considered and thoughtful review, but you’re certainly right that I do not “regard the transition movement as mainly an exercise in demonstrating to the government how much we care”. As I have briefly met Patrick a few times, and have a huge respect for him, I emailed him a couple of days ago to respond to his review. I actually made some of the same points you do, highlighting that I was trying to provide a tool for communities which examines the national context within which EDAPs will develop, rather than trying to write the local EDAPs themselves. I believe that Government actions are as much part of shaping our collective future as oil depletion rates or CO2 concentrations, so they were included in the book. In the Transition Vision of the future outlined therein (one of four possible futures considered), our government is seen taking actions that support and encourage the ongoing transition growing from communities across the world. This in no way undermines my belief that the community level is the key to addressing our global challenges. Incidentally, I did a more detailed writeup of my thoughts on The Transition Timeline on my blog last month.